If you missed this message on our home page we are currently rebranding from ‘Kymberlie Dozois Photography’ to ‘The Hennigars’. I apologize in advance for any confusion :). Since we’ve been shooting weddings together for several years now, it’s probably time for me to share the limelight. Plus, I did become a Hennigar this past April so I may as well make it extra official :)!! You can read more about us below! Both quirky and free-spirited, Kym chases after the love, laughter, and stories that unfold at a wedding. Ryan, the logical and level-headed of the pair, catches all the tender and quiet moments in-between. Kymberlie Hennigar, formerly Kymberlie Dozois, is an international award-winning photographer, shooting the majority of her work in and surrounding Ottawa and Toronto. Focusing on the deep connection between couples, she believes the priority of every wedding should be documenting it seamlessly while allowing the couple to truly live in the moment, and enjoy their day. Since picking up her first DSLR after the birth of her beautiful daughter, Rain, Kym has been inspired to document the love, connection, and intimacy in her life and in others. Soon after she was recognized as one of Canada’s Top 30 under 30 wedding photographers in both 2015 & 2016, and continues to push herself to create images with depth, artistry, and passion. Born in Ottawa, Ontario, Ryan Hennigar grew up an avid lover of story no matter what the medium: films, books, television, radio play. Ryan studied film and screenwriting at VFS in Vancouver, and after spending over 7 years in the film industry transitioned, alongside Kym, to wedding photography. Ryan is constantly scribbling in notebooks, and appreciating all art and its various formats. As a fervent storyteller and artist, Ryan’s work is emotional, intimate, and timeless. 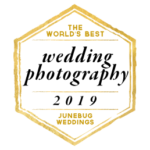 RECOGNIZED AS ONE OF JUNEBUG WEDDINGS "THE WORLD'S BEST"